MINETA SAN JOSE INTERNATIONAL AIRPORT -- Delta Air Lines canceled around 300 hundred flights Monday after its computer systems crashed, stranding thousands of passengers on a busy travel day. The flight tracking site FlightStats Inc. said that more than 1,000 flights were delayed. About six hours into the outage, the airline said that limited flights had resumed but that there were ongoing delays and cancelations. Many passengers were frustrated that they received no notice of the problems, discovering that they were stranded only after making it through security and seeing other passengers sleeping on the floor. It was unclear if the airline was even able to communicate due to its technical issues, and Delta said that there may be a lag issuing accurate flight status on the company website because of the outage. A power outage at an Atlanta facility early Monday initiated a cascading meltdown, according to the airline, which is also based in Atlanta. Flights that were already in the air when the outage occurred continued to their destinations, but flights on the ground remained there. 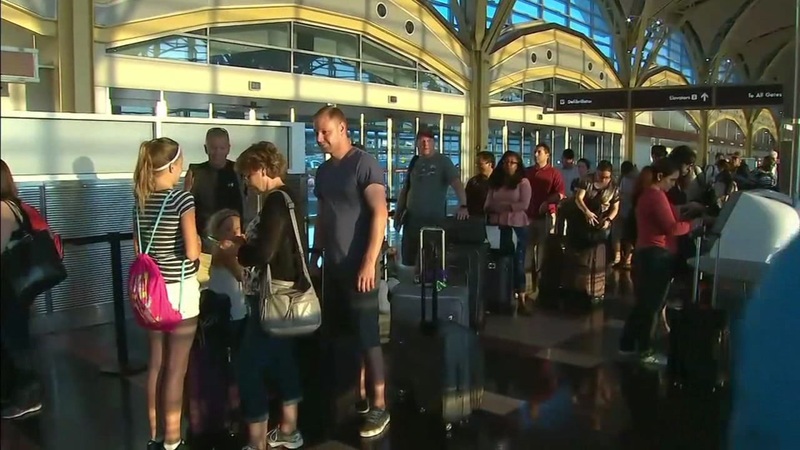 Over the next several hours, only a handful of flights took off instead of the hundreds that is more typical for a Monday morning, according to flight-tracking services. Airlines depend on huge, overlapping and complicated technology systems to operate flights, schedule crews and run ticketing, boarding, airport kiosks, websites and mobile phone apps. Even brief outages can snarl traffic and cause long delays. A spokesman for Georgia Power told The Associated Press that the company believes failure of Delta equipment caused the airline's power outage. He said no other customers lost power. A Delta spokesman said he had no information on the report. In Richmond, Virginia, Delta gate agents wrote out boarding passes by hand. In Tokyo, a dot-matrix printer was resurrected to keep track of passengers on a flight to Shanghai. Technology that appeared to be working was sometimes giving inaccurate information. Flight-status systems, including airport screens, incorrectly showed flights on time, something the company said it was trying to fix. "Not only are their flights delayed, but in the case of Delta the website and other places are all saying that the flights are on time because the airline has been so crippled from a technical standpoint," said Daniel Baker, CEO of tracking service FlightAware.com. Delta issued an apology to customers and said teams were attempting to fix the problem as quickly as possible. Many passengers, like Bryan Kopsick, 20, from Richmond, were shocked that computer glitches could cause such turmoil. "It does feel like the old days," Kopsick said. "Maybe they will let us smoke on the plane, and give us five-star meals in-flight too! " In Las Vegas, stranded passengers were sleeping on the floor, covered in red blankets. When boarding finally began for a Minneapolis flight - the first to take off - a Delta worker told people find friends who had wandered away from the gate area, or who might be sleeping off the delays. Early confirmation of the troubles first came in an official account that responds to customers via Twitter. The company had said its IT systems were down "everywhere." Several applications were affected, including the company's website. Among those affected was Tanzie Bodeen, 22, a software company intern from Beaverton, Oregon. She left home at 4 a.m. to catch a flight from Minneapolis and learned about the delays only when she reached the airport and saw news crews gathered at the door. Bodeen said that passengers were taking the matter in stride. "It doesn't seem really hostile yet," she said. The company said travelers will be entitled to a refund if the flight is cancelled or significantly delayed. Travelers on some routes can also make a one-time change to the ticket free of charge. Computer outages are a periodic plague for airlines. Last month, Southwest Airlines canceled more than 2,000 flights over several days after an outage that it blamed on a faulty network router. Unions called for the airline to replace the CEO, but the board gave him a vote of confidence. Investors shrugged off Delta's IT mishap. In morning trading, shares of Delta Air Lines Inc. rose 43 cents, to $38.10. #Delta telling airports computer systems slowly coming back online. Expect residual delays & cancellations until system is fully restored. Delta computers are slowly coming back online & expects flights from San Jose to leave on time. Customers should check the status of their flight before heading to the airport while the issue is being addressed. Due to a computer outage, flights awaiting departure are currently delayed. Flights enroute are operating normally.